Happy Wednesday! 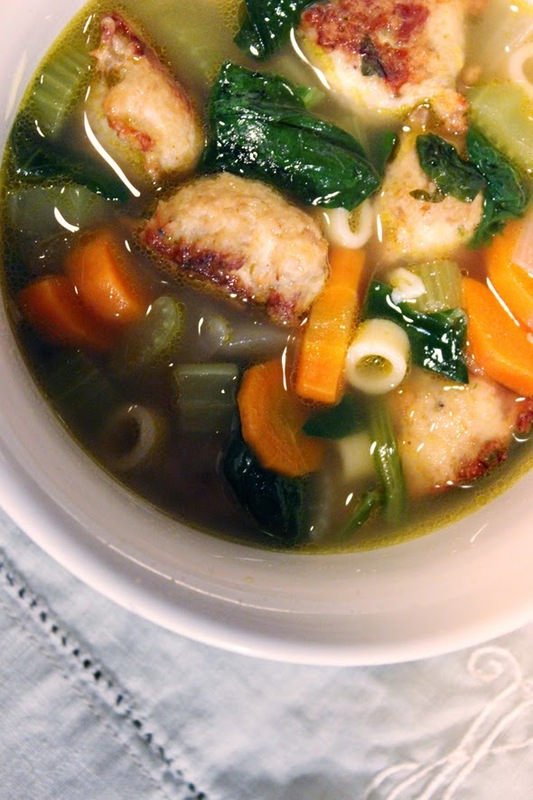 Erin of Fig + Cotton here with one of my favorite go-to dinner party recipes: Italian Wedding Soup. Pair with crusty Italian bread and a great bottle of wine, and you have a delicious and hearty one-pot meal made to please any palette. You may think that soup is a strange cuisine to serve at a dinner party, but it is one of my favorite ways to treat my guests. The best hostesses are those who are at ease upon her guests' arrival. Since soup can be made well in advance, it is the perfect party food. This recipe is truly outstanding, and the meatballs are definitely the star. Honestly, I am trying to figure out other ways to incorporate them into other meals! For the meatballs, place the ground chicken, sausage, bread crumbs, garlic, parsley, Pecorino, Parmesan, milk, egg, 1 teaspoon salt, and ½ teaspoon pepper in a bowl and combine gently with a fork. 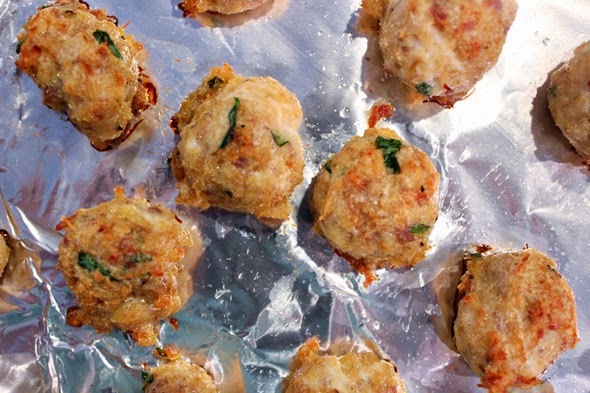 With a teaspoon, drop 1- to 1¼-inch meatballs onto a sheet pan lined with parchment paper. (You should have about 40 meatballs. They don’t have to be perfectly round.) Bake for 30 minutes, until cooked through and lightly browned. Set aside. In the meantime, for the soup, heat the olive oil over medium-low heat in a large heavy-bottomed soup pot. Add the onion, carrots, and celery and sauté until softened, 5 to 6 minutes, stirring occasionally. Add the chicken stock and wine and bring to a boil. Add the pasta to the simmering broth and cook for 6 to 8 minutes, until the pasta is tender. Add the fresh dill and then the meatballs to the soup and simmer for 1 minute. Taste for salt and pepper. Stir in the fresh spinach and cook for 1 minute, until the spinach is just wilted. 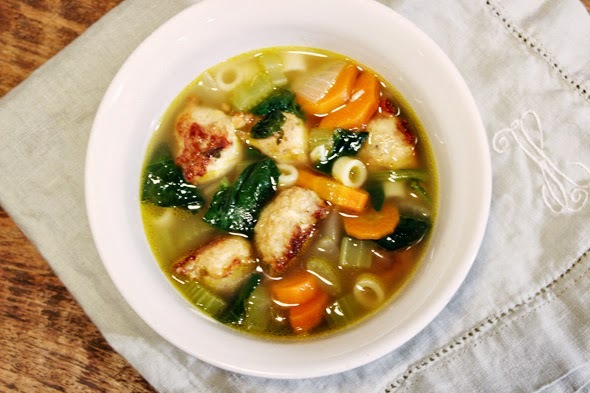 Ladle into soup bowls and sprinkle each serving with extra grated Parmesan cheese. Wow, those meatballs look scrumptious! Thanks for the recipe. I love soups, so I will have to try this one.